Your bed might be the warmest, toastiest thing in the world every morning, but the floor doesn’t always want to agree. Save yourself from that cold shock by waking up to a nice fuzzy rug beneath your feet. 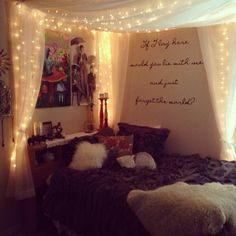 Set the mood nicely with some soft lights hanging above your bed! The glow of tiny sparkles above you will feel like a fairy tale, perfect for curling up with a movie all night. 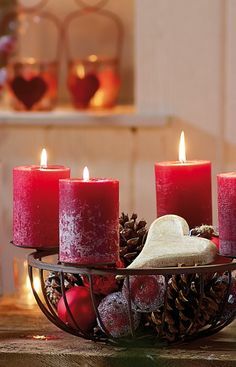 Whether they are colorful lanterns or Christmas lights with frosted bulbs, they’ll brighten up the space in subtle way. 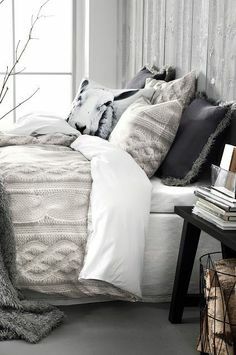 Pillows are a bedroom staple and obviously you already have one, but one of the easiest ways to up the coziness level is to add more to snuggle up with. 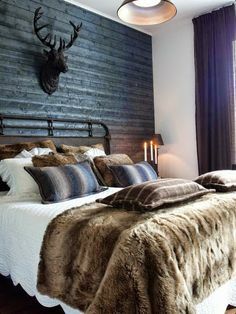 Decorative pillows and accents in textures such as knit or faux fur radiate coziness. Warm up cuddling under a furry faux fur rug. Wrapping yourself up nice and tight is sure to be cozy. Faux fur is a classic piece that brings luxury and comfort together in one decorative accessory. These trendy pieces come in your favorite animal patterns and range from short and fuzzy to long and shaggy. Fluorescent lights can come across as harsh. For a much more natural look, the soft glow of candlelight can be perfect for cozying up and relaxing with a good book for the night. Plus, they have the added bonus of filling the room with a heartwarming fragrance. 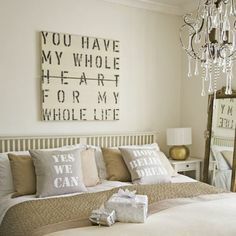 Express yourself with a quote that’s close to your heart. Perhaps have it painted on a material such as driftwood to give it a natural homemade feel. Another idea is to paint it directly on a wall. Settle into a warm bed and avoid hitting your head on a hard headboard. A tufted headboard is classically plush and totally luxe while bringing a sense of coziness. Pair it with pillows of matching colors and different textures for a stylish and comfy look. For more home ideas visit Modernize. Goose down pillows, a cosy blanket and plenty of candles – perfection!